1. Three flame comments on Internetwork Expert’s annoucement post that were going way overboard. Well they are not joining the Cisco 360 program and I for one am very happy about that. I will post a link to the specifics of their announcement today once Internetwork Experts posts it, but I for one am excited about the changes that are being made they announced in the webinar today. I will write more about it later on this week since I don’t have all the information. I had a meeting to attend for a little bit of it during the announcement…..
To give you a little backround on the topology, BB1 connects to R1, which connects over ethernet to R2, which connects via frame to R5. That’s it! So the moral of the story here is that so far as I can tell you can not apply 2 seperate offset-lists to a single interface in RIP. I suppose to do this task I could just use a distribute-list for the 2nd task. What’s The Deal With RIP Triggered Extensions?! So I am labbing away last night on RIPv2. I come across a task in the IPX Volume 1 workbook to configure 2 routers connected via p2p serial interfaces for triggered updates…OK no problem. I configure the commands, but never see the correct validation under the show command. If anybody can explain to me what the hell is going on here, I would greatly appreciate it! My only thought is it must be some sort of bug…running 12.4 code. According to the proctor guide, when doing “show ip protocols” you should see “Yes” in the column regarding triggered updates, but alas, nothing! Update: A few people have asked if they should wait to make a purchase until after the announcement. The answer is no. You actually have an advantage if you purchase before the announcement. Example: if you purchase a self-paced E2E today and the self-paced E2E changes next week you are covered by our Investment Protection Program. You can never have enough resources, sites, blogs, etc… CCIE Pursuit always seems to be in the middle of stuff like this 😉 The pimp of the CCIE Blog sites? IPexpert has .Â Â You can create your own blog hosted on CCIE Blog, read the blogs already hosted there (including Arden Packeerâ€™s excellent blog), or addÂ theÂ RSS feed for your already-existing blog to the site. The site is live as well as a new IPexpert Blog. It looks like Cisco has linked up with atleast one training partner to start offering official “Cisco” training for the CCIE Routing and Switching lab. The original wording used yesterday in the article stated that third party training companies material was not up to par at times. Which I found ironic since Cisco is teaming up with a third party training company to deliver the course material. Atleast that is the word that is flying around on Groupstudy. The courses start out at $5000 and can get up to $20,000. Which to me seems high when you have Internetwork Expert, Narbik, IP Expert and the others out there that deliver high value material at a fraction of that cost. Cisco’s take on that is they are training you to be an expert, not to just take a test. Either way this makes the CCIE training world a little bit more interesting today to say the least. Also competition is always good for the consumer as well. So in the end we all will probably benefit from this some way. Cisco is unveiling new learning program for the, saying that third-party boot camps designed to prepare candidates for the exam are not always up to par. â€œThere was a very diverse level of qualityâ€ in the third-party exam preparation programs, said Cisco marketing director Fred Weiller. CCIE had strictly been an assessment program to test peopleâ€™s pre-existing knowledge. 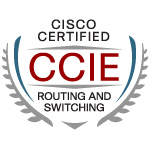 Now Cisco has decided to create its first-ever authorized CCIE training curriculum to help Cisco pros acquire the skills and knowledge necessary to become an expert. The third-party courses often trained Cisco pros well enough to pass the exam, but not well enough to become true experts, Weiller said. Update – Improved Home Lab / Getting Back Into It All! Well, it has been an extremely busy couple of weeks for me. I started a new job, and have been putting in a lot of hours, getting used to the network, learning a lot of processes, new routine, etc. Meanwhile, I sort of realized really quick I could not be very effective in my home lab with only 2950 switches. I have since ordered and received 2 3550 switches, and somebody at work was kind enough to offer to loan me 2 more. In other news, I have joined up with a CCIE study group online. It is a small group of 5 pretty dedicated guys, and we are going to meetings twice a week utilizing Skype. Much of the idea behind creating a group was the “accountability partner” aspect. It’s like when you are trying to work out at the gym by yourself…you can easily say hmmmmmmmmmm I’m sooooooooo tired and overworked today, I just can’t put myself through it. But, if you have that gym buddy that you know will be showing up and sweating it out with you, you are more inclined to go. For me, it also helps to know that others are depending on me and it isn’t just all about me. I really have not been doing much studying lately because of my equipment issue, but hopefully I will have a full home lab running soon. Also I have been doing a lot of configurations at work…seeing everything from distribute-lists to route-maps to eigrp, to rstp, etherchannels, trunks, and just about anything else. Hey everybody, if you have not heard, Jo Knight from ccielab passed his R/S lab on Monday!Â Drop on by and give him a congratulations!